Livestock auctions are not required to provide food or water, even through animals may go from auction to auction or even be transported into the U.S. The CFIA’s own records indicate that spent dairy cows spend up to 3 weeks in transit before reaching the slaughterhouse. Young “beef” cattle are forcibly weaned from their mothers and brought to auction to be bought by feedlot operators across Canada and the U.S. These calves show strong signs of distress, pacing and crying for their mothers. At auctions that cater to U.S. feedlot buyers, the calves will also be de-horned and branded. Branding involves burning or freezing the calves’ skin – no anaesthetics or analgesics are provided. Conditions are even worse for breeding and production animals such as mother pigs, boards and dairy cows as these animals frequently suffer from cripplung arthritis, developed from years of intensive confinement in gestation crates and tie stalls. The reduced mobility of these animals puts them at risk for painful electric shocks, beatings and whippings in a cruel effort to make them move faster. While these animals should be euthanized on-farm and not put through the pain of auction, producers can make up to 25% of their income off the animals’ broken bodies. 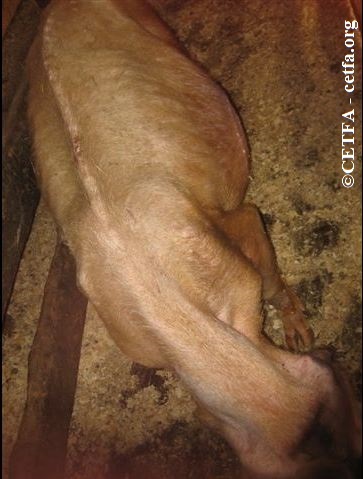 CETFA has extensively documented the conditions for farmed animals at auctions (see for example: Suffering cow brought to auction part I and part II, Shocking bull directly on face at OLEX, Emaciated laming cow with mastitis and teat cut off at auction, Bilaterally blind cow at auction, Sow with congestive hear failure brought to Ontario auction, Cattle being beaten during loading at Kawartha auction), and advocated for the animals to be given food, water and proper treatment or be humanely euthanized when necessary (see for example Providing water to cull sows at collecting station) or rescued them when possible (see for example: Downer bird rescued from Amish auction). Provision of food, water and bedding for animals. Pre-conditioned calf sales where calves are weaned through a less-distressing process. A ban on branding and de-horning. A ban on electric prods. The immediate humane euthanasia of non-ambulatory animals, with a monetary penalty issued to producers who bring in these suffering animals. 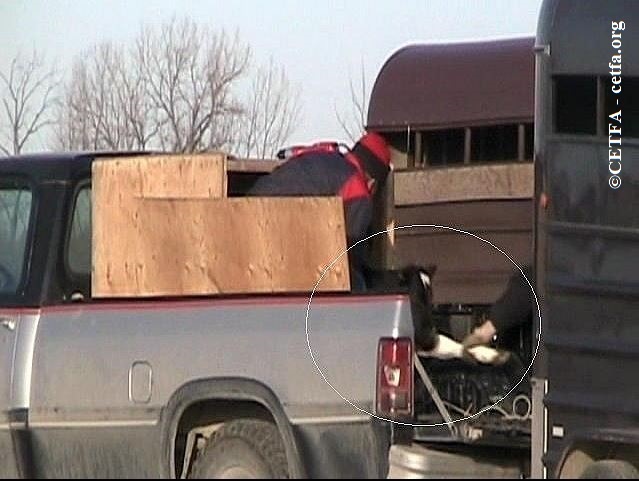 Calf dragged at Winnipeg auction. 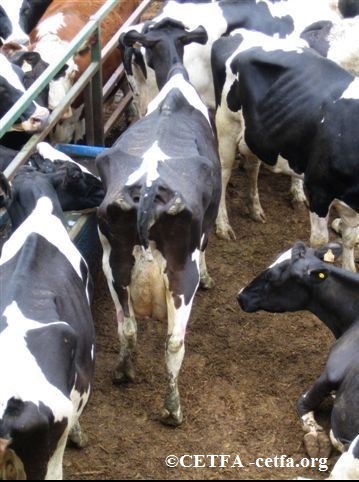 Emaciated cows at Ontario auction. Sick sow brought to Ontario auction. 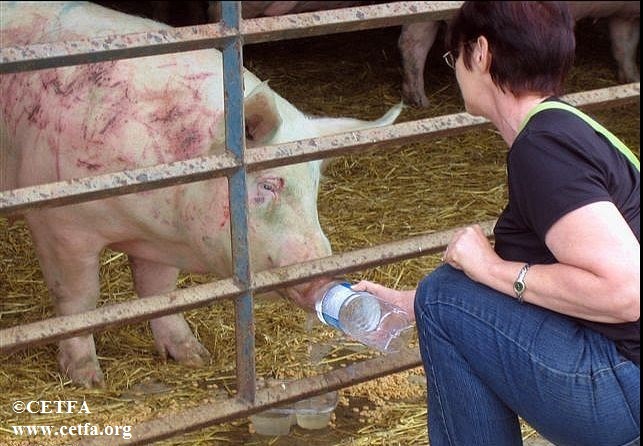 CETFA inspector giving water to a thirsty sow at a livestock auction. Bringing water to dehydrated and sick sow at Ontario auction.